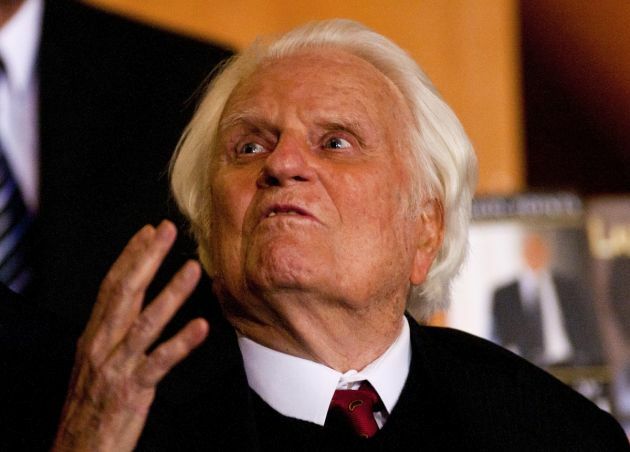 (Photo: Reuters / Chris Keane)Billy Graham gestures while attending a book signing for former U.S. President George W. Bush's new book "Decision Points" at the Billy Graham Library in Charlotte, North Carolina December 20, 2010. Although he is 94 years old, evangelist Billy Graham is still preaching the Gospel, preparing recorded messages for a major November outreach using the mass media in North America just before his birthday. The strategy of the evangelistic effort, called My Hope with Billy Graham, is to target people in the United States and Canada through media and personal relationships, according to the Billy Graham Evangelistic Association (BGEA). 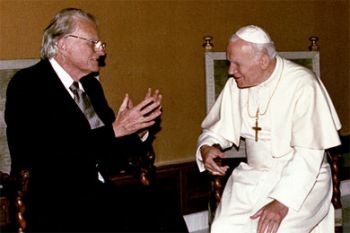 (Photo: My Hope with Billy Graham)Billy Graham met with Pope John Paul II in 1993. Graham is recording messages from his home in North Carolina to be broadcast during a major evangelistic outreach in North America in November. He will turn 95 that month. "Under the guidance of their local pastors, Christians across these two countries will open their homes to share the Gospel message with friends, family, colleagues, and neighbors using different media programs featuring Billy Graham, dynamic music, and testimonies," says the BGEA website. "Like the Apostle Matthew, some will invite their guests into their homes to learn about Jesus using primetime television, while others will gather at a coffee shop or the park to watch the program on a tablet or smart phone." Graham's last public crusade was in New York City in 2005. "My Hope" will make a huge effort in the area once again. "In 2005, more than 1,400 churches came together in a united effort to proclaim the Gospel across the city, and nearly 10,000 committed their lives to Christ," said Brent Rinehart, who wrote of the push on the BGEA site. "Many of those same churches who were integral in the 2005 Crusade are now turning their attention to a new evangelism effort in their city, My Hope America with Billy Graham." New York City has historically been a focus of Billy Graham's missionary endeavors. His longest-running Crusade (16 weeks) was held there in 1957. In addition, Graham conducted his first domestic all-Spanish Crusade in New York City in 1960. The largest audience he has ever addressed in North America was at a one-day rally in Central Park in 1991. Graham's remarks will be distributed by television, DVD and Internet. The My Hope with Billy Graham website is already running clips of videos containing Graham's preaching and individual testimonies. In one clip, called "Lose to Gain," two men and a woman share how they came to Christ. They each discuss the crises that brought them to faith, how they heard the Gospel, and the change the message made in their lives. As they share their stories, clips from relevant parts of Graham's earlier crusades are shown. "There is only one message in any generation," Billy Graham said in a promotional video for the My Hope campaign. "That God loves you, Christ died for you, and he rose from the dead because of you. And it's good to see him here and now and in this life." The messages from Graham to be shown in November will discuss how he sees today, according to BGEA Chief of Staff Ken Barun, as reported by Spartanburg, South Carolina television station WSPA. He will also answer questions from Pastor Don Wilton, a Spartanburg pastor, as they sit in Graham's Montreat, North Carolina home. The My Hope campaign began as a result of an initiative by Franklin Graham, Billy Graham's son, to take his father's messages around the world, according to its director, Bill Conard. He said the effort began in 2002 with outreaches in four Central American countries. "It's a great challenge. We had never done this before," said Conard. "God led us along the way and the results were enormous," said Conard. "Thousands of people came to Christ." The My Hope project has taken place in 57 countries in 10 years, he said. Billy Graham was a pioneer in the use of media for evangelistic purposes. He began broadcasting his sermons over the radio during a Christian show called "Songs in the Night," according to the American cable channel Biography. He also hosted a program called "Hour of Decision," which at its peak ran on 1,200 radio stations. Eventually, it became a television program. Graham preached publicly for over 40 years via radio, television and crusades. He is thought to have preached to more individuals than anyone in history. "It's really very exciting to think that as Billy Graham has been praying and seeking God in these latter days of his life he will be sharing with America via this specially prepared program the unique message and burden God has put on his heart for this time," said Preston Parrish, vice-president of My Hope America. "We think people are going to be very interested in what he has to say."